With its latest economical duo, Perreaux has manufactured magic, writes Andrew Baker. BACK WHEN I was into stereos and music, but had yet to discover the dangerous-but-highly-rewarding world of actual hi-fi, all I knew of New Zealand-made stereos were the locally manufactured PYE all-in-ones, Bolan Acoustics and David Reid Electronics. Oh, I had heard of Perreaux, but guess what? I thought they were a French company. Yes, it was a sheltered existence. Today, there are of course a good few New Zealand hi-fi producers – Plinius, Image, Eco Fan to name just a few – but one of the most successful thus far would have to be the company started in Napier as far back as 1974 by one Peter Perreaux. The company began by mainly producing commercial PA systems, but Perreaux soon turned to the domestic audio market and in 1979 they produced the well-received SA80B integrated and PMF200 power amplifiers, both using MOSFET transistors. Over the years since, they’ve released many favourable amplifiers (all employing MOSFETs) and speakers, leading most recently up to the award winning high end Radiance, Prisma and Eloquence ranges and now of course, the more affordable Audiant series. 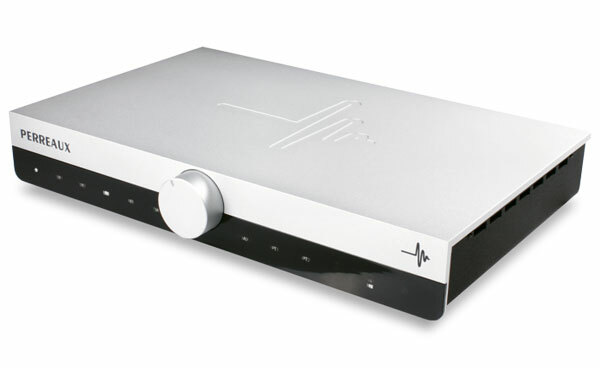 The Audiant 80i integrated amplifier received high praise from critics all over the globe, including New Zealand. Adding separate pre- and power amplifiers to the Audiant family is an astute and natural move and the affordability of the 80i has been retained, thus hopefully allowing not just audiophiles, but also humble civilians, the chance to own affordable gear with high end credibility. With their thick brushed/matt-silver CNC-machined aluminium top plate, folded down the front to form the top half of the fascia – the bottom half of which is the touch-control panel – the DP32 and 100P are attractive and heavy little beasts. Tap the top and it feels like you’re tapping a heavy paving slab, a cover that also serves as a heat sink as well as providing a mechanically stable, vibration free environment for all those sensitive internal components. The DP32 has a smooth-operating matching brushed-silver volume control in the centre of the front panel, and across the bottom are the touch-selectors for power on/standby and the various inputs, plus their corresponding indicator lights and the display for the USB DACs sample rate. The 100P power amp has just the one touch/light: power on/standby, and both units feature the Perreaux “wave length” symbol machined into the top. Around the back of the DP32 preamp is an impressive array of inputs and outputs. Along with the main power on/off switch, mains socket and trigger outputs for remotely controlling all compatible devices, we have two unbalanced auxiliary inputs (Aux1 and Aux2) and a balanced (XLR) input; this is also the Aux1, and a switch is provided to select XLR or RCA for the Aux1 input. The Aux2 input can be switched between ‘Line’ (normal) and home theatre operation where the preamp volume control is bypassed so it can be integrated into a full home theatre system. There are also balanced and unbalanced preamp outputs for connecting to a power amp and a line out (unbalanced) for recording. An RS232 port is provided for service and software update use. A big drawcard of the DP32 will doubtless be it’s built-in DAC which supports asynchronous USB audio up to 24/192 kHz sample rates, and for this there is of course a USB input (24/192), an AES/EBU input and two each of coaxial and optical inputs (32/192) so you can connect other digital sources – CD players, DVD players, Sky, digital tuners, etc. A nice touch is the addition of an output level switch, allowing users to bypass the volume control and use the DP32 as a stand-alone DAC which can be connected to another pre- or integrated amplifier. The DAC uses an ESS Tech Sabre ES9018 Reference 32-bit DAC with a maximum input of 32-bit/192 kHz into AES/EBU, coaxial and optical and 24/192 into USB. A remote control is provided to control all functions and it can be used to dim the front panel display in three stages. The DP32 weighs 8kg and measures 431mm x 305mm x 67mm (width x depth x height) so it’s of average size and not at all imposing visually. The Class A 100P MOSFET output power amplifier weighs 12kg and measures 431mm x 286mm x 67mm (w x d x h), and has balanced and unbalanced preamp inputs (and a switch to select between the two) as well as two pairs of high quality speaker input terminals, power on/off switch, power socket, trigger inputs and an RS232 port. Perreaux typically use MOSFET output transistors in their amplifiers and the 100P is no exception – said to give the benefits of both valve and solid state amplification, MOSFETs can generate less heat and use less power and can give dynamic valve-like sound with great bass reproduction. With a high current power supply it puts out a decent 100 watts per channel into 8 ohms and 145 wpc into 4 ohms and features a full suite of sophisticated protective functions with the inherent purpose of protecting your precious speakers and amplifiers from such events as overheating, blown fuses and AC fail. Perreaux advises allowing plenty of space in order to aid air circulation and prevent the amp from over-heating. I noticed no excess temperatures even after extended and loud listening sessions; a good deal of warmth, certainly, but you couldn’t cook an egg. None-the-less, giving amplifiers plenty of room is always advisable. I set the DP32 and 100P amplifiers on their own rack connected together with a short (.50cm) pair of RCA interconnects, and plugged in my venerable Denon SACD/DVD player via both coaxial and RCA out/inputs – to be used as both a transport and separate source to ensure I was assessing the amplifiers’ capabilities and not just those of the DAC – and my laptop, employing Media Monkey to play a selection of high resolution files, via USB. If using a PC, the driver can be easily downloaded from the Perreaux website and will have you up and running in no time at all. I used a variety of speakers: my own Spendor SP2/3s plus Castle’s Howard S3 floor standers, Mission SX2s (review pending) and Paradigm Signature S1 V.3 stand mounts (review pending), all of which performed admirably and matched very nicely with the Perreaux equipment. Martin from Perreaux advised me to give the amps around 75 hours to “burn in” before serious listening, and while I indeed endeavoured to do this, I have to say the pair sounded pretty fine straight out of their respective boxes. Needless to say, after a good running-in, I settled down for some serious listening. The opening bars and blips of Radiohead’s ‘Pakt Like Sardines In A Crushd Tin Box’ from their 2001 album Amnesiac came from a deep and silent background, the like of which I had never experienced before. I could have heard a pin drop between notes, and the resulting level of detail and spatial awareness was quite breathtaking. The Audiants were bringing out sounds and effects from beneath the music I hadn’t noticed before. The listening room was alive, seething with detail and pulsing with rhythm – image projection was amazing, with everything out in the room, to the far left and right of the speakers as well as far behind and in front. Piano on the next track, ‘Pyramid Song’, had convincing timbre with well-defined edges to notes and a rich, expressive nature which contrasted nicely to the background synth effects and the wholly realistic drums and cymbals. Thom Yorke’s voice was spectral, floating in its own space within the music. Besides the silent noise-floor, it was also apparent that the DAC had a proper analogue flavour with very little digital glare or harshness to be heard. Mavis Staples’ 2013 album One True Vine has fast become a staple for testing out audio equipment in my house. It is a nicely recorded, intimate album with easy-going and uncluttered instrument arrangements. The funky ‘I Like The Things About Me’ had a catchy rhythmic bass line which stomped through the amplifiers, and there was great delineation of Spencer Tweedy’s (yes, Jeff’s son) metronome-like cymbal taps. Staple’s vocal had a kind of ultra-clarity – as in fact did everything, including the muted distorted-guitar riffing and the dirty guitar solo – giving her an almost alarming presence, along with her backing vocalists who were nicely separated out to sound like distinct individuals. Ms Staples’ voice was vivid and full of nuance: breathy, husky, and exultant. The DP32/100P gave an almost real-life view into the recording room – in this case Wilco’s The Loft of Chicago, and I couldn’t settle on just the one listen. Probably just one word could be necessary to describe the Perreauxs: addictive. To see how the Perreaux amps coped with more complicated music, I tried out Sufjan Stevens’ ‘Jacksonville’ from his ambitious and largely well-executed 2005 album Illinois. This track, like some others on the album, can become overwhelming and muddled when heard in some systems. There is a lot going on here: a string quartet, piano, banjo, drums, bass, various vocalists. The DP32/100P handled it with ease, separating everything out so the room was full with the entire ensemble easily distinguishable in their individual roles. Certain sounds and instruments became much more apparent than usual: the piano had particularly brilliant tone and the string section created high pillars of sound on either side of the vast soundstage, supported by bursts of brass and that fabulous banjo (on which I could hear individual strings being plucked, even from within the rest of the mix). The stonking bass and drums provided a firm, meaty foundation and Stevens’ and his backing singers’ vocals were clearly divided and totally un-swamped by the music. The sound was lush, with beautiful depth and a powerful, driving rhythm; the MOSFETs, I guess, adding a slight valve flavour to the sonic signature. Now on to that all-important audiophile genre: Jazz. I’ve always preferred my jazz on vinyl and though I’ve heard The Oscar Peterson Trio’s easy listening 1965 album We Get Requests on vinyl, I’ve thus far only managed to procure a copy on CD. Fortunately it sounds great on digital format and wonderful through the Perreauxs. This was another lush and spacious experience, neatly layered and colourful with sharp and natural transients and a natural easy-flowing character – ‘Goodbye JD’ had a particularly rhythmic energy and an infectious swinging tempo. Peterson’s expressive and vibrant piano sauntered and swaggered throughout the recording, accompanied by the lavishly textured double bass and drums (Ray Brown and Ed Thigpen, respectively), creating a truly immersive experience while highlighting the musicians’ abilities, along with their respective flair. If I did have to fault the Perreaux at this point – specifically the 100P – it would be just to mention that the bottom end was slightly lacking in terms of energy and the last degree of excitement – this isn’t to say the bass isn’t punchy and involving, because it is. The lower registers were still authoritative and well defined, but the bass just doesn’t rumble into being in quite the way to which I’m accustomed. This really is nit-picking and I’m sure that careful speaker matching will alleviate this and, to be fair, I soon easily overlooked this as I became enamoured of the amplifiers’ candid nature and their ability to extract seemingly every last detail and nuance from a recording while giving an immaculately clean, richly flowing, smooth sound. And the layers! I felt that if I wanted to I could hack my way through the beautifully layered music with a machete like Indiana Jones through some thick Peruvian jungle. Pitch Black’s infallible Rhythm, Sound and Movement – (Rude Mechanics Remix) album was a classic example of this, where I could hear through each sound and into the next and every detail and effect was sharply focused and illuminated. The Perreaux duo has a way of circulating, radiating sound out to the sides of the room and around almost behind me: at times it seemed like all four walls were lined with speakers. The midrange was smooth, transparent and packed full of detail with a near valve-like fluidity, the treble lively and accurate with impressive transient attack. Some could possibly describe the sound as clinical, but prolonged listening will soon dispel such speculation, as the Perreaux amplifiers’ inherently appealing characters are surely revealed. All the aforementioned speakers I tried with the DP32/100P worked a treat – the Castle’s comparatively laid-back nature and rich, warm bottom end were a great match, counter-acting some of the explicit detail of the Perreaux with some tasty bass, yet the more revealing speakers – Mission, Paradigm – never became fatiguing or analytic at the expense of musicality, and I never felt overcome by the high level of extreme detail. The amp combo took control of the speakers with graceful authority, exhibiting great tonal balance and dynamic range, but most importantly allowed music to maintain its full emotional tension and release, creating an extremely enjoyable listening experience. I am back on the fence as to whether or not I need high resolution digital files in my life – is CD quality 16/44.1 all I – or anyone – will need, or is it worth pursuing higher sample rates in the hope of gleaning as much detail as we can? Listening to HD tracks by artists such as Ella Fitzgerald (24/192), Bill Evans (24/192), Eric Clapton (24/96) and Monolake (24/96) through the Perreaux – and any other high quality DAC for that matter – I did seem to perceive a heightened degree of clarity and sparkle. Using my Denon SACD player as a source only, via RCA, showed just how good the 100P and the DP32 as amplifiers really are. While music didn’t quite have quite the same level of depth, detail retrieval and clarity as it did through the Perreaux DAC, I was still incredibly impressed with how good it did sound – engaging and musical – proving that the amplifiers are as much the stars as is the in-built DAC. The rewards gained from using higher-end sources will be unequivocal. If Ashley Kramer is already compiling his Best Of 2013 list, then I shall have to add the Perreaux DP32/100P to my own, I enjoyed them that much. Listening to these amps will really take a veil off your music – there is such transparency that at times it was as though I’d just had concrete plugs removed from my ears. Detail is lovingly coaxed and caressed from the mix, soundstages are deep and spacious with punchy and involving sound and as a result, listening sessions tended to be lengthy and convoluted, as the collection was repeatedly and enthusiastically explored. This duo made speakers, equipment and even the walls seem to disappear, enveloping the listener in dynamic, colourful sound. It was amazing to hear such dead silent backgrounds, and this gave music more presence and intimacy – and this not just from the excellent DAC but also from the amplifiers themselves, as using other sources demonstrated. The Perreauxs revealed the finer intricacies of recordings without losing track of musicality or, most importantly, fun – which in my opinion is the mark of a good amplifier. Nice review Andy. Seems like a special bit of kit. However, blowed if I’d be spending 5.5k on a couple of boxes that look like a cross between a Freeview decoder and a tuner from the 80’s. Truly awful. Well, fill your boots Ben. If you want to buy a SOUND system based on how it LOOKS, who am I to argue……. didnt think touch screen tech was that big in the 80s…..